Beets have been a staple in the human diet for thousands of years. 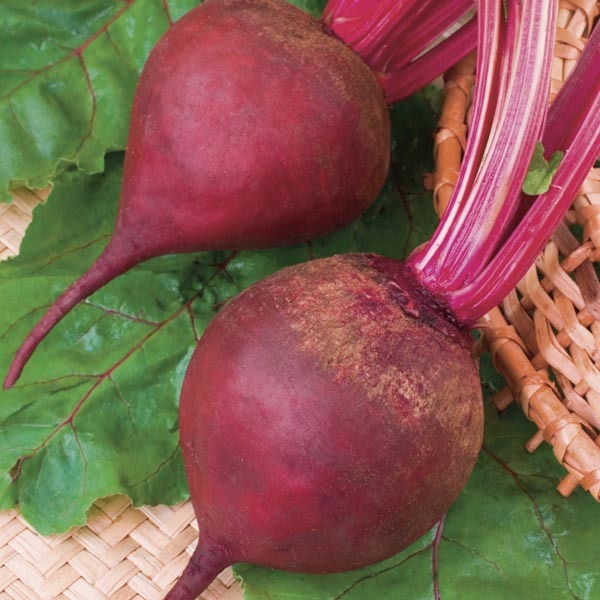 The wild ancestor to today's beets grows in the regions near the Mediterranean Coast and references to beets have been found in ancient Greek and Mesopotamian writings. All parts of the beet plant are edible and highly nutritious. They are a great source of vitamins, minerals and antioxidants. Delicious baked or boiled. Cooked beats can be chilled and chopped for condiments, sliced in salads, or prepared as a cold soup. "Borscht" is a chilled beet soup popular in Eastern European countries. Beets may be canned or frozen for later use. Greens can be eaten fresh when young. Older greens can be cooked similar to spinach. Wash fruits, vegetables and herbs thoroughly before eating. Plant in a reliably sunny spot. Prefers fertile, well-drained soil and cooler temperatures. Keep soil moist, watering freely in dry weather. Harvest as needed.